The Nivea 4 in 1 Firming Body Oil with Q10 reduces the appearance of stretch marks, nourishes the skin intensively, evens skin tone and gives you noticeably firmer skin in just 2 weeks! It has an unique fast absorbing formula with coenzyme Q10, Avocado Oil, Cottonseed Oil and Macadamia Oil, that helps to nourish sagging and crepey skin to give you firmer, even looking and beautiful skin. About the Brand: A brand trusted universally, Nivea is a leading international skin care company that brings to you innovative skin care and cosmetic products. Nivea understands skin like no one and the brand is known for it's specially formulated skin products for different skin types, that cleanse, nourish and protect the skin while keeping it radiant and beautiful. Explore the entire range of Massage Oils available on Nykaa. 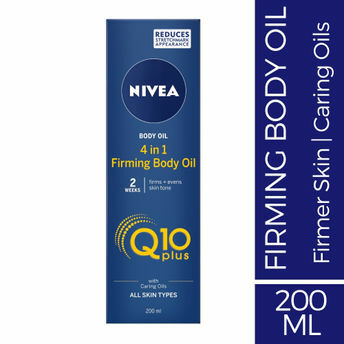 Shop more Nivea products here.You can browse through the complete world of Nivea Massage Oils .